Over The Counter (OTC) Healthcare - Changing Marketing Strategies | Business Article | MBA Skool-Study.Learn.Share. What you will do when you catch a sudden cold or get a headache? Chances are that you will search in your medicine box for a pill of No cold or Aspirin. Exactly most of people will do the same because now the trend is expanding towards the most inexpensive form of health care which is self-medication with over the counter (OTC) medicines. So increase demand leads to increase in competition which in turn leads to increase in need of differentiation in between various over the counter products. OTC drugs means drugs which are allowed to be sold “Over the counter” without the prescription of registered medical practitioner.OTC medicines are advertised non prescription medicine. OTC drug are manufactured under the manufacturing license but do not require a drug license and can be sold without prescriptions. Non drug licensed store can sell only few medicines classified as home remedies. But rules and regulations in villages of population below 1000 people, subject to other conditions. Leading players in Indian OTC healthcare market are Cipla Ltd, Johnson & Johnson and GlaxoSmithKline Plc. Currently pains, cough, colds, hyperacidity, minor topical infections and indigestion are major OTC categories. Emerging categories due to change in lifestyle include cuts, wounds, burns, muscle pains, sprains, diarrhea and constipation. 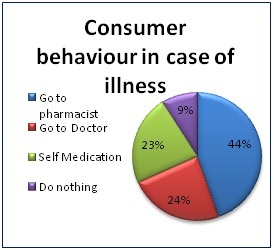 1) Time and money: Lack of availability of time has increased OTC medicine to cater day to day elements. People even opt for not approaching to doctor to reduce the cost of treatment. 2) Belief: The belief in self medication has increased and people start treating minor elements by themselves for major elements they go to doctor. 3) Chemist: The importance of chemist has increased. For minor elements like cold, headache, fever, pain etc they take the advice of chemist rather than going to doctor. In small town chemist is treated just like doctor. 4) Awareness: Increasing awareness among the consumer made them realize that some medicines and health supplements must be available in the home all the time. 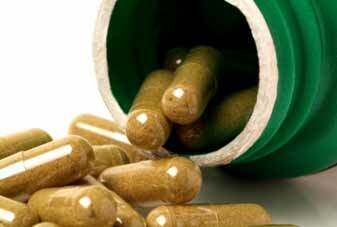 Some of OTC medicine has become part of grocery such as Chyawanprash, cough syrup, Crocin and balms. 5) Lifestyle: Changing lifestyle lead to development of various lifestyle diseases for which herbal medicine is best remedy. Due to urban lifestyle there is a large increase in need of slimming products. Most of healthcare products are moved into personal care products. 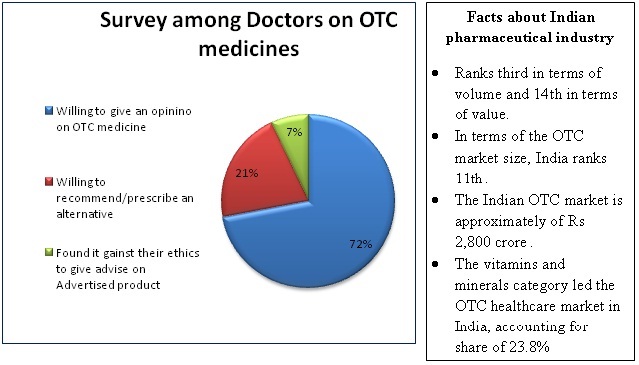 OTC medicines are using the FMCG way to connect with consumer at emotional level, to build brand loyalty to increase awareness and brand reorganization in mind of consumer. Looking at the clutter in the market today, conventional print and television advertisement won’t work. The chance of skipping is high in television. Company has to use some innovative advertisement. Many pharmaceutical companies have realized their target consumers and are going for television tie-ups and embedded marketing. Reaching the target audience is most important. The first ever brand to come up with innovative idea is P&G Vicks. In the early eighties company tried a mass sampling idea by giving a coupon in newspaper and in exchange of this coupon one can get two Vicks action 500. This single campaign caused mass sampling of Vicks action 500 in a single day. Even conversion of Vicks inhalers into key chains proved a good campaign. 'Cipla I-Pill' was the most advertised brand on TV during January-September 2007. FMCG products are lifestyle based and OTC products are need based. The Indian OTC market is growing much faster than the prescription market. So it is necessary to build bond of trust and confidence with customer. There is need for differentiation and companies are spending on brand building. Brands like Revital, Smyle, Iodex , Hajmola and Crocin have succeeded in establishing customer loyalty and positive brand image. The importance of branding in the pharmaceutical industry is also evident from several brand acquisitions in the recent past. The acquisition of ‘i-pill’ for 950 million strengthens Piramal’s OTC portfolio, which has another strong consumer healthcare brands such as Lacto Calamine skin care range, Supractive Complete, Saridon etc. There are various features that need to be addressed by pharmaceutical companies during branding. It may be important to link emotions with brand because the best way to capture attention is by evoking an emotional response. Most importantly, it is fundamental that the product be efficient and able to deliver. The challenges include low penetration in rural areas, liking of home remedies to OTC products, high competition among the OTC medicine segment. While differentiating OTC products attractive graphics, design and good packaging play a big role, because the consumer and the buyer is the same. To strengthen the OTC segment there is a requirement to raise awareness regarding the possible use self medication through OTC medicines and possible abuses of self-medication. For enhancing OTC brand portfolio switch of Rx to OTC is required. The vitamins, cough & cold, antacids, antipyretics and NSAIDs are opportunity areas for switch. India does not have a well documented process or a specific regulation on switching Rx to OTC products and this is becoming need of the hour. There are many products in the Rx sector which could be revitalized through OTC switches. Healthcare is one set of products that take time to enter and settle in market, but once that happens consumer trust is build and it last long. This article has been authored by Divya Bhatia from Welingkar Institute of Management Development and Research.